In Fine Mille black genuine leather with Snakeskin combination. Minimum Order Quantity @ 5 External Features: All genuine leather 2-Pen Case Dimensions: H = 16 cm x W= 6 cm) Colors: black snakeskin accent. 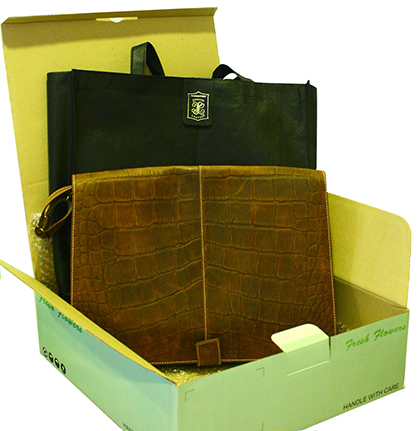 Your fine leather gift item is packed in its own Leather Collection environment-friendly bagand is wrapped carefully with a bubble wrap for extra protection during transport. Then the item is placed in a trendy and sturdy packaging box especially designed to get your gift safely to its destination. Let our nice postcard style greeting card deliver your message of love. This can accommodate about 50 words to express your deepest affection.